treated people without asking them for money. My mother Men Malin was a primary school teacher. In the beginning of 1975, there were too many bombs dropping in the countryside, so people who lived in the rural areas started to come into Phnom Penh. Many of them lived in the temples and other public places, like the hospital where my father worked. The prices of food kept mounting every day. changed into civilian clothing; I knew this because I saw many army uniforms on the ground near the hospital. My father and two of his friends cut up their nursing uniforms, made a white flag from them, and ran it up the hospital flagpole. He told me that this white flag was a sign that we would surrender. I stood in front of the hospital, watching the tanks and cars going by. Moments later I heard the sound of glass breaking and saw that the Khmer Rouge soldiers were smashing all the hospital windows. When the Khmer Rouge saw my father, they put a gun to his forehead and asked if there were Lon Nol soldiers hiding in the hospital. They searched, but could not find any. One of the soldiers told my father that our family had to leave the city within three or four days because the Americans would be coming to drop bombs. He also said that all of the patients who could walk would have to leave the hospital. A little later, they went into the hospital and pulled the IVs out of patients who were undergoing treatment and shot them. My father put his family in an ambulance and headed west to Pochentong Airport, but soon, the Khmer Rouge soldiers forced people to travel north along the smaller roads. So we had to abandon the ambulance and carry only the most important things, like rice. I wasn’t able to help because I had polio when I was small and could not walk without a stick. The village where we stopped was in Kampong Speu Province. The base people, and even the soldiers there, were kind and gentle. We had enough to eat because it had a big lake where we could catch fish. After three months, we were relocated to Pursat Province. My parents worked in the rice fields there, while I was a cowherd. We were only able to meet late at night during self-criticism meetings. A Khmer Rouge cadre who was around my age educated all the villagers. Instead of addressing your mother as “Mother,” you had to call her “Comrade Mother.” And instead of using the polite words num or pisa for “eat,” we were to say “haup” instead. The Khmer Rouge said that the old terms were capitalist and reactionary, so they had to be eliminated. 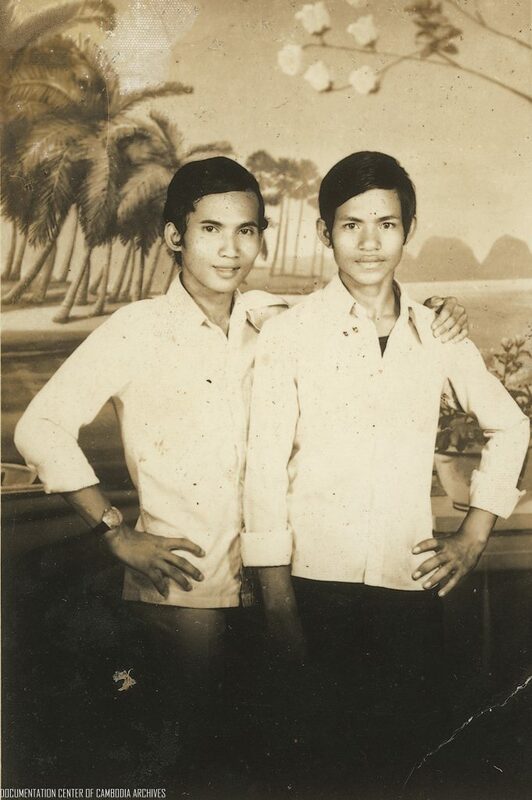 In 1976, the Angkar arranged for three of my cousins to marry handicapped Khmer Rouge soldiers. All three of them refused. The next night, they were sent for re-education. The following morning, I heard some village soldiers talking; they said that they had slept with three virgins from the city and then inserted poles into their vaginas. The three women couldn’t breathe after this and died. I wanted to hit those soldiers with my walking stick, but I could only keep my anger inside. When I told my family what I had heard, they cried aloud. The next week, my family was transferred to Thkol Village; it was a place where they punished new people. My father was sent to the southern part of the village, which was where they kept those who committed serious crimes, and the rest of us were sent to the northern part for less serious offenders. We had to live in cooperatives there. We were not allowed to eat privately and had to give all our valuable belongings, especially watches, to the Angkar. When we first went to Thkol Village, it had about 2,000 people; half of them were killed while we lived there. sister’s death, the Angkar accused me of having a connection with the enemy. They transferred me from the kitchen and made me a cowherd. because I was afraid the Angkar would hear me crying. That night, I asked the village chief if I could bring my mother a piece of rice crust and sweet potato. I wanted her to have them when I broke the news to her. She cried after I told her about finding my father’s body; then she ate the rice crust. My grandmother was the next to die. She was over 70 years old and had been looking after young children. A teenager told me she had been accused of stealing a child’s rice soup, so the village chief hit her with a stick. I ran to her house and saw that two elderly women were digging a grave for her. I arrived just in time to pay my last respects to her. Since so many of my family members had died, I started to feel nervous about this regime and worried that I might lose my mother. My fears came true. Early one morning, a woman came to tell me that my mother was having difficulty breathing. At first, my unit chief wouldn’t give me permission to go to her, but I kept begging until he gave his consent. I held her until she died. For the Khmer Rouge, her death was like that of a dog or cat; it didn’t matter, and there was no funeral or monks, nothing at all. Then four of my younger siblings died at the same time from malnutrition. Their bodies swelled up and they no longer looked human. They complained because their skin felt so tight; there was nothing anyone could do but hold them. 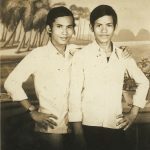 This story is based on an essay Mei Monyroath submitted to a contest sponsored by the Khmer Writers Association and the Documentation Center of Cambodia in 2004.